We have seen that God has given us a belt of truth with which to gird the loins of our mind as we stand our ground against lies, deception, and heresies. We have also been given a breastplate of righteousness, the imputed righteousness of Christ that covers our hearts, allowing God to see us as right with Him because of the finished work of Christ on our behalf and the imparted righteousness that makes it possible for us to do what is right for the right reasons as we walk in holiness unto the Lord. As we have been told to stand, withstand, having done all to stand, and to stand therefore, we almost get the idea that standing is important in spiritual warfare! That means that while we might not think that our feet are important to the battle that we fight, the feet are those members of our body upon which we do stand. If we lose our footing and slip we are open to attack. If we trip we fall victim to the advance of the enemy. So what piece of armor has been given for our feet? Now we will see in examining Ephesians 6:15 that in order for us to stand, we have to have sure footing. The Roman soldier wore thick leather sandals that had straps that wrapped around their ankles, sometimes all the way up to their knees. These sandals offered support and sure footing. 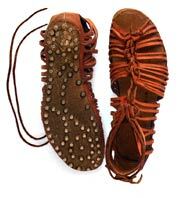 Most of the time, these sandals were covered with small pieces of metal to offer protection for the feet. Usually they also had metal spikes, nails, or cleats on the souls to give the soldier sure footing in treacherous terrain. Just as an athlete today wears special shoes with cleats, or a golfer has spikes on his shoes, so too a soldier has special footwear to ensure his ability to stand his ground or to move quickly in advancing or even retreating on the battle field. We see that the shoes we wear are the readiness of the gospel of peace. The good news in the midst of spiritual warfare is that we have peace with God through the gospel of Jesus Christ. Just as we learned with the breastplate, we are right with God, but even more than being justified, we are at peace with God. When we understand just a fraction of the holiness of God we see how high a price is required for our redemption. It is only through the life, death, and resurrection of Christ that we have any hope of finding peace with God. So often so many are deceived and believe that they have made their “peace with God,” but sadly that usually only means that they have soothed their conscience with a false assurance that God will accept them as they are even though they know nothing of repentance, saving faith, or obedience. The truth is that we cannot make peace with God on our terms. In order for us to be at peace with God we have to have a Mediator, someone to stand between the two of us and make peace. That Mediator is Christ Jesus. He is the only Mediator between God and men, Himself being both fully God and fully man. He alone can stand in the gap between us. 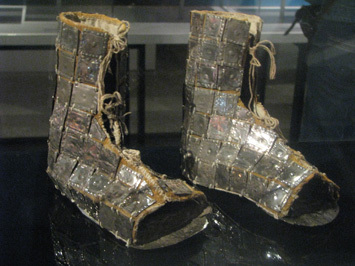 But even more than the gospel, these shoes are said to be made of the readiness of the gospel. Yes we have put on this spiritual armor at the point in time that we were saved, but we need to learn how to use it, and we need to see that there is more to the armor than just being saved. We are at peace with God and that gives us great confidence and security in our fight with the world, the flesh, and the devil. But even more than having peace with God, these shoes represent a readiness with the gospel. We are living on edge so to speak, always ready with the gospel. Ready to hear it in our own lives when we need to be reminded of the great truths of God’s grace, and ready to use the gospel in battle. That may mean preaching the gospel to the lost as we are engaged in warfare for their souls. It may mean reminding others in our own ranks about the truth of what Christ has done for us in order to strengthen one who is weak or even rebuke one who is sinning and losing ground. Readiness can also be translated preparedness. Matthew Henry says that this refers to having a “resolved frame of heart.” That is, we embrace the gospel, not just for salvation, but we cling to the good news daily as a needed support in the midst of battle. We need the gospel. Let us never fall for the lie that we have already believed and are saved and so no longer need to be reminded of the good news about what Christ has done to give us peace with God, the forgiveness of sins, and the power both to will and do what is pleasing to God. Our study of the gospel is a lifelong pursuit! Are we resolved to stand our ground? Are we ready to stand our ground in the face of relentless attacks and the schemes of Satan? Have we dug our feet in to the solid rock that alone can uphold us in times when we are surrounded by dangers, toils, and snares?